MS Windows Mobile 5.0, 240x320, Bluetooth 2.0, GPS, SD/MMC, Marvell PXA270 312 МГц, 64 Мб RAM, 128 Мб ROM, 165 г, 71x117x16 мм. MS Windows Mobile 5.0, 240x320, Bluetooth 2.0, Wi-Fi, SD/MMC, Marvell PXA270 312 МГц, 64 Мб RAM, 128 Мб ROM, 77.65 Мб Flash, 158 г, 70x117x15 мм. MS Windows Mobile 5.0, 240x320, Bluetooth 2.0, Wi-Fi, GPS, SD/MMC, Marvell PXA270 416 МГц, 64 Мб RAM, 1024 Мб ROM, 830 Мб Flash, 186 г, 73x122x19 мм. MS Windows Mobile 5.0, 240x320, Bluetooth, Wi-Fi, GPS, SD/MMC, Intel XScale PXA272 416 МГц, 64 Мб RAM, 128 Мб ROM, 85 Мб Flash, 186 г, 73x122x19 мм. MS Windows Mobile 5.0, 240x320, Bluetooth 2.0, Wi-Fi, GPS, SD/MMC, Samsung S3C2440 300 МГц, 64 Мб RAM, 128 Мб ROM, 122 г, 58x108x17 мм. MS Windows Mobile 6.0, 480x640, Bluetooth 2.0, Wi-Fi, SD/MMC, Marvell PXA310 624 МГц, слот CF I/II, 128 Мб RAM, 256 Мб ROM, 190 г, 75x134x17 мм. MS Windows Mobile 6.0, 240x320, Bluetooth 2.0, Wi-Fi, SD/MMC, SDHC, Marvell PXA310 624 МГц, 64 Мб RAM, 256 Мб ROM, 115 г, 69x117x14 мм. 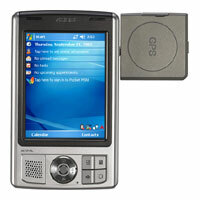 MS Windows Mobile 5.0, 240x320, Bluetooth 2.0, GPS, SD/MMC, Samsung SC32442 400 МГц, 64 Мб RAM, 1024 Мб ROM, 170 г, 76x120x16 мм. 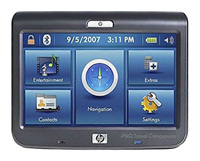 MS Windows CE 5, 800x480, Bluetooth 2.0, GPS, SD/MMC, SDHC, SiRF Titan ARM11 600 МГц, 128 Мб RAM, 2048 Мб ROM, 187 г, 110x86x18 мм. 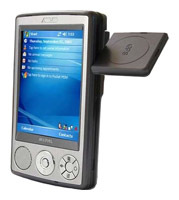 MS Windows Mobile 6.0, 240x320, Bluetooth 2.0, Wi-Fi, GPS, SD/MMC, SDHC, Samsung S3C2443 400 МГц, 64 Мб RAM, 2048 Мб ROM, 170 г, 72x115x18 мм. Internet Tablet OS 2008, 800x480, Bluetooth 2.0, Wi-Fi, GPS, miniSD, miniSDHC, Texas Instruments OMAP 2420 400 МГц, 128 Мб RAM, 256 Мб ROM, 226 г, 72x128x14 мм.